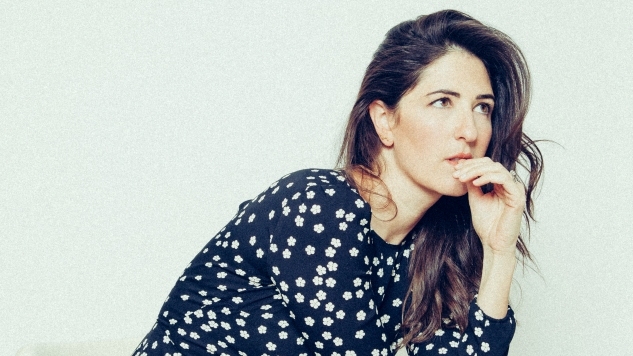 D’Arcy Carden owes everything to the Upright Citizens Brigade (UCB). Her love for the sketch and improv comedy troupe is so strong that she talks about it for the majority of our 30-minute interview. It’s easy to understand where this appreciation comes from. The group, which was founded by the likes of Amy Poehler, Matt Besser, Adam McKay, and so many others, has helped produced some of the most recognizable names in comedy—rom Donald Glover to Aubrey Plaza (and we could spend the rest of this piece naming more). After years of struggling in Hollywood, doing the auditioning grind and getting bit parts, Carden is one of them. She’s most recognizable these days as Janet, the artificial construct on the road to self-awareness on The Good Place, but she also has a supporting role in the HBO dark comedy Barry and is featured on the Audible improvisation podcast Bad Reception (which features a lot of other UCB alumni, including Paul F. Tompkins, Lauren Lapkus, Nicole Byer and more). She’s having such a career moment that both she and her husband joke that something horrible is about to happen. Carden has been in entertainment for over a decade. At first she wanted to be a theater actor and went to school for that, but noticed she kept getting cast in comedic roles. After school, she decided to join UCB, which she considers the best of the comedy schools. Despite that pedigree behind her, she struggled to find consistent work. She was able to get by thanks in part to some of her UCB colleagues, who cast her in shows like Crazy Ex-Girlfriend and Broad City, but for a while, Carden wondered if it was going to happen, if she was going to get her big break. Being in a creative profession means you’re constantly facing the pressure to succeed and to impress (ask anybody at Paste), but Carden said that once she let go of that pressure a few years ago, things started to turn around. The character is getting more in touch with human emotions. She’s learning what it’s like to be jealous, to be angry, to be lonely, and that has allowed Carden to show she’s more than just funny. She can be different types of funny, but also many levels of real. While she and other cast members were kept in the dark throughout Season 1 (due to that twist), she says she’s been more in the loop for what’s to come. Carden says that a lot of the cast believes Season 3 is the show’s strongest, and also most complicated. Carden has been playing all sorts of characters, showing that she’s more than just the eternally cheerful Janet. In the HBO dark comedy Barry, she plays Natalie, an acting student alongside the main character (played by Bill Hader), which takes her back in many ways to her struggling acting days. However, even with all the roles and the exposure, Carden maintains a pragmatic view of her future career. She knows that nothing lasts forever (especially TV shows), or that things can crash and burn any minute, so she’s just trying to remain positive and grateful. “I truly don’t know how I get that lucky, to be on three shows that I’m so proud of and love so much,” she exclaimed. “I’m very aware that’s not always the way it goes, or the way it’ll always go for me, so right now I’m trying to really enjoy every day on set, or every week. Either way, going forward she’s going to keep acting and keep connecting back to where it all began at UCB. Now that she’s a recognizable name, she hopes to do what others did for her, and help get more UCB actors cast. Of course, she’ll also continue to do shows there, as many alumni do despite hitting the big leagues. It makes sense that she would bring up the comedy school so often. It’s her past and her future.